Porcelina's World: Pale Denim Pencil Skirt & A Leotard! 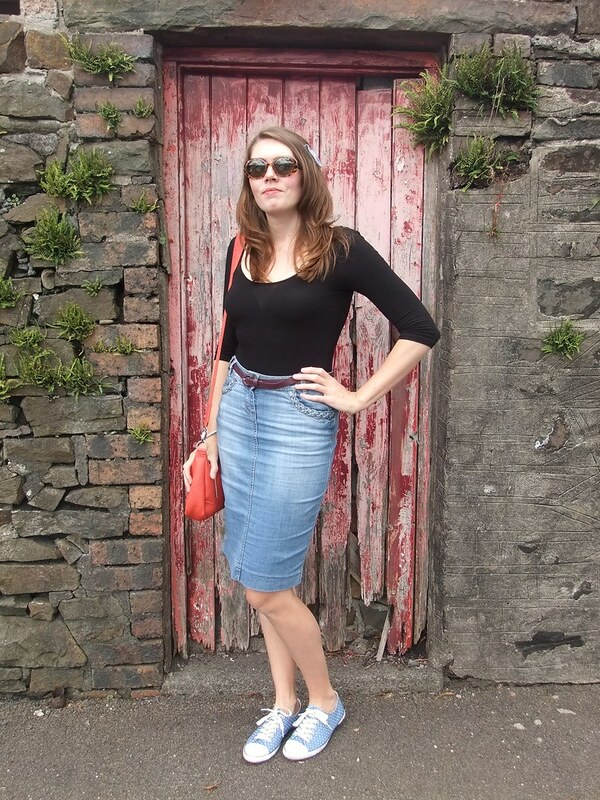 Pale Denim Pencil Skirt & A Leotard! This outfit was supposed to be 1950's inspired when I started dressing, but somehow, by the end of it, it had lost any sense of that. I started with the denim pencil skirt, but instead of the retro shirt I'd laid out to go with it, I changed my mind and went with a leotard. I then chose to leave my hair loose rather than doing the intended quiff, as I was short of time. And there you go, it's a bit more '80s. My other half's comment was "like Jane Fonda". I'll take that as a compliment! So there you go, I'm not wearing anything vintage or vintage inspired. I had to confess. And rarely for me, everything I'm wearing was bought new, from proper shops. I suppose lots of people wear brand new all of the time, but I felt a bit guilty, and perhaps because of this I came home with an extra-large haul from the charity shop - 3 dresses and 4 tops for just £5. That's more like it. The fabulous bag is by Paquetage, and is a new purchase, with a Zalando voucher I won from a giveaway the lovely Catherine ran over on her blog Not Dressed As Lamb. Thanks again Catherine! Cute! I so did this look in the 80's! It looks fresh and chic on you! Well, I think it's a compromise - an 80s-does-50s look! And very lovely too. I'm the same, if I don't wear anything vintage, I feel a bit odd (yesterday's jumpsuit and denim jacket was a case in point!) but there's very little in my wardrobe that isn't secondhand. Looking forward to seeing what you found in the charity shops. Its a timeless look, the body and denim skirt show off your fab figure a treat and those sweet little pumps add cheekiness. The Jane Fonda hair do goes perfectly with this outfit. cute look! i love the sunglasses :) so retro! Love this outfit! 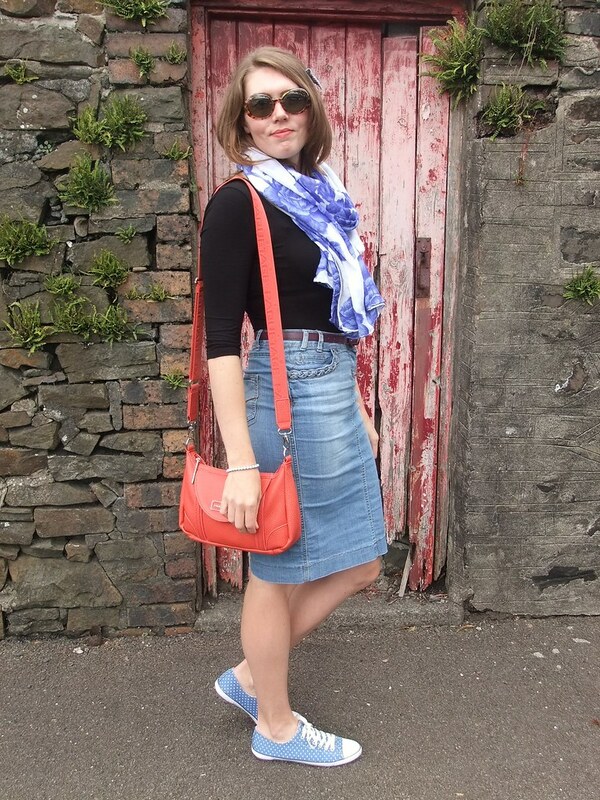 That denim skirt is seriously adorable and those shoes are just the perfect touch! Those polka dot shoes are reminscent of the 50s, love the sunglasses and the outfit looks great on you, the black and denim are a classic! So cute! 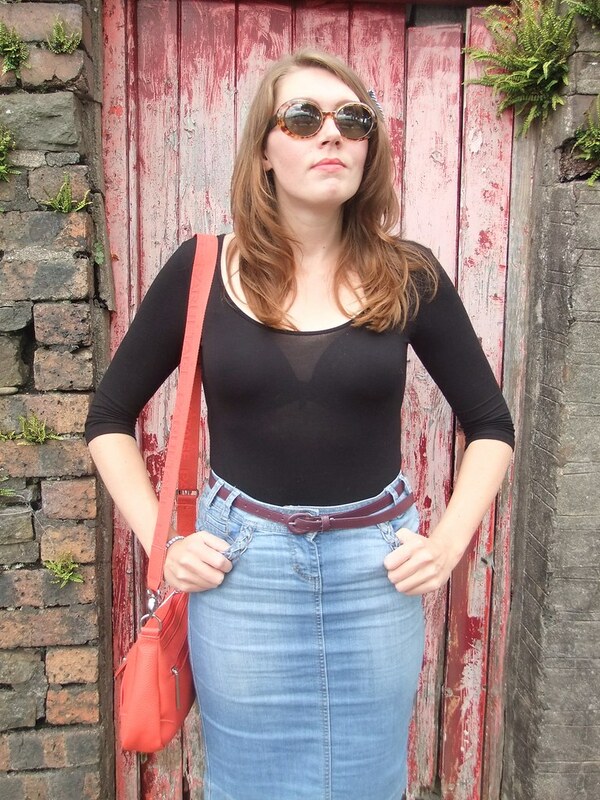 I love the look of the denim pencil skirt and your sunglasses are perfect :). Gorgeous!!! 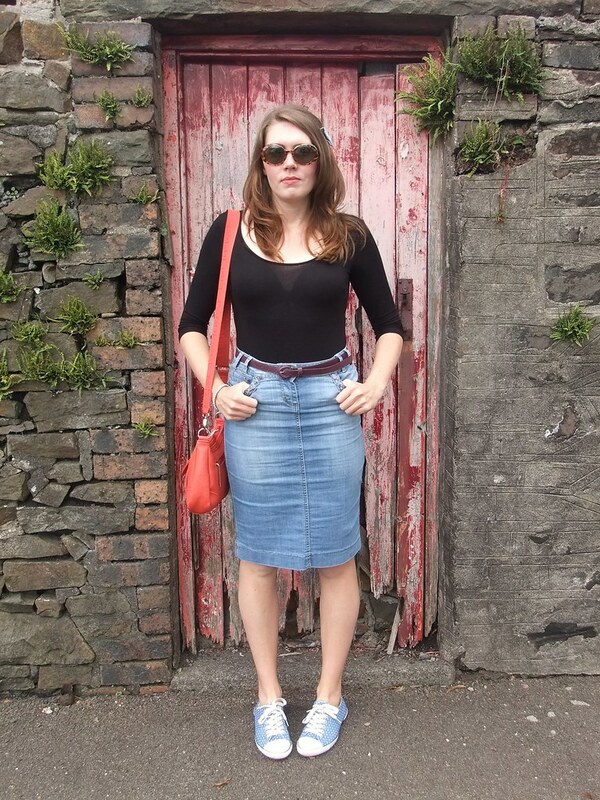 I have a vintage dark denim high waisted pencil skirt that I love wearing with flats (and often saddle shoes), too. That combo has such a classic, youthful feel to it and is super ideal for long days on one's feet. Have a Great Day!! <3 Ada. I love that skirt with the braided pockets...and that backdrop is so pretty! 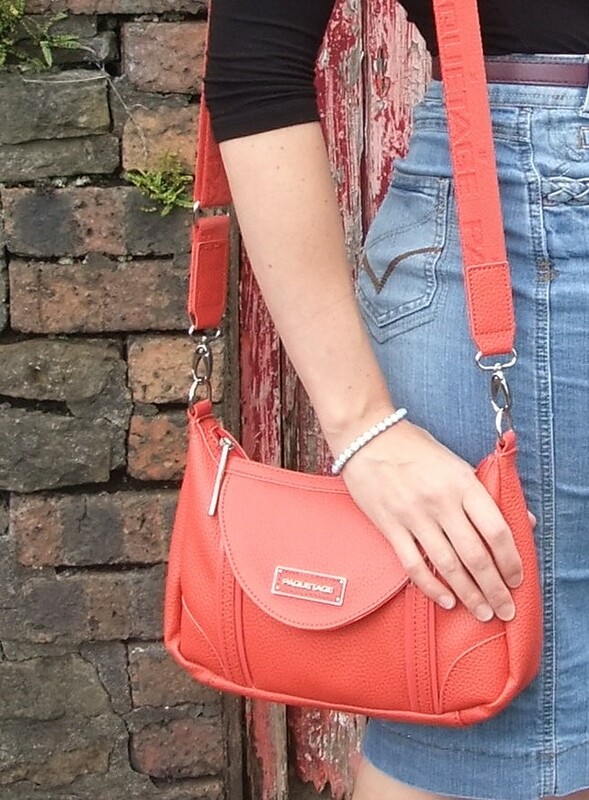 Love your orange bag, it's so different. Zalando have some great pieces. Cute polka dot pumps too!